Your industrial infrastructure faces new threats every day. Whether intentional and malicious or unintentional and accidental, the impact of these threats can be tremendous, leading to costly downtime or lapses in control that could jeopardize your operations and profits. Protect your infrastructure. 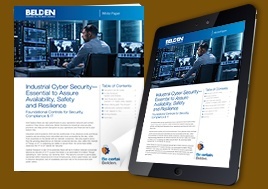 Belden’s broad portfolio of industrial cyber security products gives you visibility to and protection from events that threaten the safety, quality and productivity of your mission-critical systems. 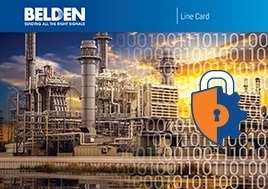 From hardware devices with embedded security features to cyber resilient software, Belden helps you transform raw system data into actionable information so you can build a powerful defense against disruption of any kind. What’s Your Top Concern Right Now? 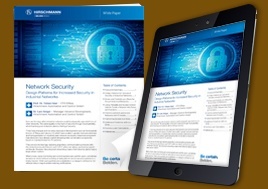 Take your first steps to real network security. Then, follow this continuum to expand and strengthen your security efforts over time. A true security solution expands and changes over time. Follow a continuum like this one — from network infrastructure to passive logging to more advanced solutions, such as continuous real-time change detection. Integrate cyber security with your existing infrastructure. This reference architecture shows a typical model for coverage of a plant operation. The ring topology is just one of many configurations our solutions support. View our full portfolio of products or visit Tripwire.com. Control system cyber security threats were rated “High or Severe/Critical” by 69% of the respondents of SANS Institute’s 2017 survey of global ICS security professionals. As more and more devices get connected … as the lines between the plant floor and the office blur … as automation technology and hacker technology evolve and expand … concerns around cyber protection multiply. Understanding what is happening is your first step to building a successful protection plan for your industrial system. Enterprises that wait for that "significant" cyber event before they act will find a sobering price tag. UNINTENTIONAL THREAT $2M Excessive network traffic recently caused a major UCA nuclear plant $2M after cooling drive controllers crashed. ACCIDENTAL EXPOSURE TO MALICIOUS THREAT $14M Exposure to an internet worm shut down 13 auto plants for less than 1 hour, but cost the company $14M. MALICIOUS INTENTIONAL ATTACK $1T The Stuxnet virus set Iran's nuclear program back 2 years. A similar attack on the US could cost the government $1T. Whether malicious or mistaken, cyber events put worker safety at risk, shut down production, disrupt public utility services and erase profits. The lesson? Start now. Start with your most critical assets. Start with auditing where you are today. Start by aligning your IT and OT protocols. Where you start doesn’t matter – just start. Who Owns Industrial Cyber Protection? "…reliance on control systems continues to expand across not only industrial settings, but also the operation and maintenance of our cities, our buildings and all kinds of modern smart applications. The convergence of IT and operational technology (OT) has now come into popular awareness as the lines between the Internet of Things (IoT) and the Industrial Internet of Things (IIoT) have blurred and the media have given increased coverage to security breaches and their impacts"
IT vs. OT: What’s the Difference? Traditionally, industrial enterprises kept everything separate. The Information Technology (IT) group managed the office network where the environment was mild, internet speed was important and security of confidential information was the biggest concern. Meanwhile, down in the plant, the Operations Technology (OT) team faced harsh environmental conditions with a closed, air-gapped network. Their primary object was simply to keep production running – safely. A look at IT and OT priorities would look something like the image to the right. Katherine Brocklehurst, “Cyberattacks and Bottom Lines: Who Has Responsibility for Industrial Cyber Risks?,” Advancing Automation eBook, Vol. III:20-25.
in light of new cyber security threats. 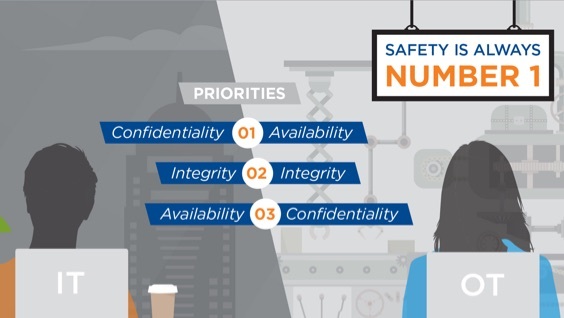 IT and OT professionals come from different backgrounds with different priority orders, yet they want the same thing: a reliable and secure manufacturing environment. Now that OT systems are internet protocol (IP) enabled, there is increased risk for intentional and accidental harm. Recent examples of malware and malicious computer worm attacks include Stuxnet and Triton. Now, more devices on the plant floor need to be connected to the Internet. Remote locations must be managed from one central location. Executives in the office demand data to manage plant maintenance, upgrades, output quantity and quality and inventory levels. That means blurry – or nonexistent – lines between IT and OT roles and responsibilities. The network of the future will be unified to serve both worlds. Merging the automation networks of the factory (OT) with the data exchange office network (IT) requires intentional actions. Here are a few steps to get you started. Explore the industry’s broadest portfolio of industrial hardware/software solutions. You’ll find solutions designed for maximum uptime, safety and security for your critical infrastructure. All from one vendor with the brands proven to improve your security posture. Check out our newest blog series where we sit down with Tripwire in-house experts to provide you with a more personal view on the current state of cyber security in the industrial environment. See our broad portfolio of industrial hardware/software solutions for your critical infrastructure. Explore design patterns for increased security in industrial networks. Discover what’s essential to assure availability, safety and resilience in your industrial network. Belden and Claroty join forces to provide shop floor to top floor visibility and protection. 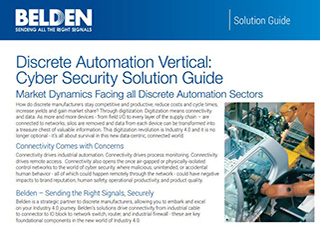 Find the cyber security solutions you need specific to discrete automation applications.